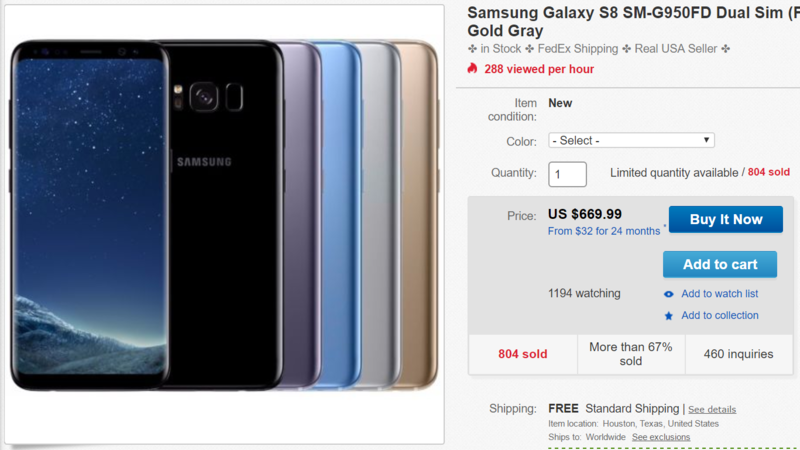 We covered this particular seller before when they were selling the Exynos model of the S8 for $730, but a month later and it's down another $60, and still quite a bit cheaper than most other retailers. Just like before, since it isn't available at most stores it's tough to set an exact price on savings, but the average seems to be around $730-800 for the S8 and $830-950 for the S8+. So even conservatively speaking, this is a pretty decent deal. The eBay seller has pretty high feedback and ratings, so there shouldn't be too much concern about who you are purchasing from. They are also shipped from Texas, so if you are in the US, it shouldn't take long to arrive. Take note, though, that this is the international model. It doesn't support all the frequencies used by US carriers. Notable omissions are Band 12 support for T-Mobile, as well as some AT&T LTE frequencies. You will want to double check the specifications listed for each phone with your carrier. If you aren't quite convinced that Samsung's latest pair of flagships are for you, perhaps you should consider giving our review a look. We found the recent entrants in the Galaxy S series to be pretty solid little phones, with a fantastic screen, great battery life, a good camera, and pretty decent software.